Reduced to an empty lot picked at by developers, Granite High’s historic specter still haunts South Salt Lake. Connie Anderson talks about the loss of Granite High School like the death of a family member. The nearly three years she spent there teaching family and consumer science was the highlight of her 17-year educational career. "I felt like I was making a difference," she says of the 500 students she estimates were attending the school when it closed. "It just felt like a family." The fondness is personal, not just professional. She, her dad and her daughter all graduated from Granite, three generations of "Farmers," just like their quirky, overalls- and cowboy-hat-wearing mascot. They each spent formative teenage years at the South Salt Lake City school at 500 East and 3300 South. Later in life, she sat on the lawn with other community members watching fireworks, and walked laps around the track. Anderson recalls all this less than a mile from where the iconic school once stood, in a cozy, beige split-level house shaded by a massive London plane sycamore tree in the front yard. She's lived close by since 1960. For more than a half-century, Granite High was how she defined her home—her place in the world. "I used to tell people that I lived south of Granite High for all of my life until they tore it down," Anderson says. "Now, where is that sense of where I live?" It's tough to understand what razing the campus means to the community unless you live there, Anderson says. A school isn't just a school. It's more than books, bricks and black tops; it's a community gathering place, a meeting spot that defines the neighborhood. "It was a loss," she says. "It's hard to even drive by now." While Granite High is gone, the land remains—27 acres, to be exact. The empty space is slowly being filled, more than a year after the buildings were demolished in the summer of 2017. But for some local residents, the school's legacy is still at stake. The raw feelings over what was lost and what could still be built spark critical questions about public versus private interests. Where some see an opportunity for housing, others see a possibility for parks. The spirit of the Farmers, it seems, lives on. "It was hard for everybody, whether you had a kid that went to Granite," Anderson says, her voice dropping to a whisper as she recalls a difficult period in South Salt Lake's history. "It was hard for people to see the buildings go down." With the buildings razed, all eyes are on the former campus as officials try to figure out what will replace them. Garbett Homes purchased slightly more than 16 acres on the southern part of the property. Eileen Whiting, the company's director of sales and marketing, says they're planning on building 76 single-family homes. Demand was so high, that prospective buyers camped out for a few days to land a spot in the new development. As of last month, 27 homes were under contract, going for a price between $405- and $507,000. "We're offering home ownership in a location where you can't typically find brand-new homes," Whiting says. "We've got tax-paying dollars that will be coming into the community, as opposed to an abandoned school that was just boarded up." The northern portion of the land—about 11 acres—is under contract with Wasatch Commercial Management. Granite School District still technically owns the space, but Wasatch has asked South Salt Lake to rezone the space they plan on buying, so they can build more than 100 townhomes. As Wasatch waits to see whether it can build high-density housing, Garbett's section of the property is a work-in-progress. Piles of soil lay beside partially- and fully-finished houses. A large green-and-white sign sits beside the homes, advertising the community's new name: Granite Legacy. "That's a little bit galling" Anderson says of the name. "To me, 'Granite' has a very special meaning, and it isn't commercial, and it isn't people trying to make money off the property." Before it was a fenced sea of construction and unkempt, uncut grass, before the trailer tracks and the unfinished roads and sidewalks, before the gate was erected to keep South Salt Lake residents out, the space that once housed the school was open to all. Local children played baseball or rode bikes on the asphalt, while older residents frequented the campus for exercise. Not all the public use was positive—according to some news reports, the old buildings were sites for crime and vandalism. In 2009, the Granite School Board, of which Anderson was and still is a member (though she emphasizes she speaks for herself in this article, not the board), voted to close Granite High, shuttering the buildings that were a school for 105 years. The storied structures remained standing for almost a decade until they were leveled. Anderson taught at Granite shortly before it closed. She remembers the school as one that educated throngs of students from different backgrounds and socioeconomic statuses; it was a melting pot of immigrants and refugees that taught white, U.S.-born scholars like her daughter the value of diversity. Even then, the school wasn't just a school, but an egalitarian experience that forced young people to engage with classmates from broad social and cultural circumstances—interactions that are all too rare later in life. "It was a gift for my daughter to be there with all those different cultures and languages and skin colors, because it taught her how to be tolerant," Anderson muses. Ben Horsley, district spokesperson, says recollections like Anderson's aren't accurate. By the time the school closed, he says, there were 255 students at Granite High—not 500, as Anderson remembers—and it never served a significant number of refugee students. He acknowledges the student body was racially and ethnically diverse at the time of Granite's closure, but the majority of students were from families with low incomes, not a socioeconomic mix of middle- and lower-class families. Demographics aside, Horsley says most of the local school-aged youth chose not to attend Granite High around the time it closed. "Roughly one-third of students boundaried to the school were not attending the school," Horsley says, meaning they exercised their right under state law to attend a public school other than the one they live closest to. Under-enrollment was one of myriad issues that led to Granite's closure, he adds. After the shutdown came the question of what to do with the land. In 2011, South Salt Lake tried in vain to secure a bond so the city could purchase the school. Had voters approved the $25-million price tag, the city would have opened recreation and civics centers, and the outdoor spaces would have been preserved. Only one-third of the city's registered voters cast a ballot. The bond initiative failed by five votes. Four years later, the city tried to float a $13-million bond to acquire parks and open space, some of which could have been spent on the former Granite High. It failed by 65 votes. Given the school's history and influence on South Salt Lake's culture and environment, Horsley says the district initially felt selling the school to the city would be the best use for the land. "But their voters obviously felt contrary," he says, referring to the failed bonds. 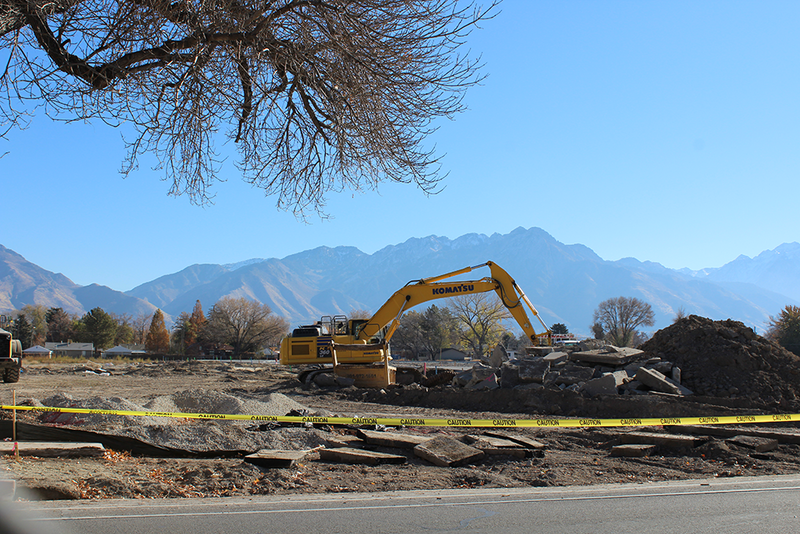 "As they were tearing the buildings down, if I'd see people from South Salt Lake, especially the people in my neighborhood, they said, 'We could have had a park,'" Anderson mourns, years later, about the failed bond initiatives. "I think that would have lessened the blow, to be able to have had a community center." With South Salt Lake out of the picture, the school district considered its options. "We just got offers and took the one that benefitted taxpayers the most," Horsley says. Former SoSL Mayor Jim Davis. Wasatch Commercial Management, the other developer planning on adding housing to the community, aims to build 113 townhomes. In order to do that, the land will have to be rezoned, as single-family homes only are allowed now. Adam Lankford, Wasatch Residential Group's vice president of development, says the company submitted a master plan to the city in the spring that would create a new zoning—a so-called "Granite Zone"—that also would allow for construction of a 30,000-square-foot county library. South Salt Lake Mayor Cherie Wood, who does not personally grant or deny zoning applications, stresses that the library and townhome development's fates are intertwined; rezoning for a library means the townhomes would also be allowed. "I need to support the best project for our community, which I do think is having a library," Wood says. Salt Lake County Library Director Jim Cooper confirmed there is a purchase agreement with the developer for space to open a library. Once that happens, the nearby Calvin S. Smith and Columbus libraries will close and combine into the new facility on the former Granite campus. Cooper says the county has developed site plans and a few initial ideas about what the facility might look like, and how they can incorporate memorabilia—yearbooks, trophies, pictures—from the historic school. "We're trying to move forward judiciously and prudently to protect taxpayer dollars, but we think it's the right thing to do," Cooper says. "It'll be a new, more modern building but we think we'll have some elements that will respect and honor the old Granite High School." Granite High might have been a historic building, but Cooper says it wouldn't have been a great fit for a county library had the old edifice still been standing. "There's just a ton of things you would have had to save and retrofit," Cooper says of the old structure, like dealing with plumbing and HVAC issues, not to mention the cost of renovations. Starting from scratch and building anew is cheaper, he says, than appropriating Granite High, were that still an option. Should the plan be approved by South Salt Lake's Planning and Zoning Commission, the city council then would weigh in on the rezoning, District 4 City Councilwoman Portia Mila says, estimating she and her peers could vote sometime in early 2019. Concerns abound on what high-density townhomes could mean to the city's traffic and infrastructure. Mila likes the idea of a new gathering spot on Granite's grounds, though she isn't sure she'd support the rezoning if the vote were held today. "We're not going to get a community center, which is what South Salt Lake wanted originally," Mila says. "That is not happening no matter how much we wish, because there's homes being built now, but so what can we live with?" One thing many locals don't want is a Walmart, a possibility that Wood vetoed. Citing potential crime and increased traffic, multiple people interviewed for this story adamantly opposed the retail behemoth opening a location in their neighborhood. Mila says she believes the superstore is no longer a part of the current talks. "I hope a lot of those people against having a big-box store will be able to see that reasoning, 'OK we can live with high-density living here so that we can get a good community resource, a library,'" Mila says. Anderson is more skeptical. "I have not been impressed with the integrity of the developers," she says. "Because now, we're being blackmailed that if we want the library, we have to have [those] townhomes." She likes the idea of a library, but she's wary of Wasatch's intentions, and she doesn't want to see more high-density housing in a community she says already has a surplus of similar homes. "So we hold the library hostage in order to get high-density housing?" Anderson says. "That, for me, has been one of the disillusioning things—to have to deal with developers." Lankford says Wasatch could just try to put in all townhomes rather than talking with the county about a potential library. "Having a civic component on this site, we just think makes a great project," he says. What's more, Lankford says, Wasatch's interest in purchasing the land from the school district isn't dependent upon the rezoning. "There's lots of options if this didn't materialize," he says, like putting in all single-family homes over the 11 acres and staying within the existing zoning parameters. But, he says, "to have the whole site single-family homes does not leave a legacy for Granite." Wasatch will adjust accordingly if the county backs out of the library or if the rezoning isn't approved, Lankford says, but he's optimistic it'll get done. No matter how things shake out, "We don't plan on going away." Steve Norr, another Granite alum who still lives in the area and who makes a living as a kitchen designer and realtor, acknowledges the "insane demand for homes" in the city, but he doesn't know any local residents, including himself, who want to see the land zoned for high-density housing. "We just want to be respectful of the site," he says. "That property will be in the memories of people who went to that school forever." Anderson, a former PTA president at Granite, shows off her Bronze Farmer service award. Jim Davis talks about the empty land that used to house Granite High like it's an ex-lover, the one that got away. On an overcast November morning, the former South Salt Lake mayor and Granite alum stands behind the gate and wistfully recalls memories past. "That's where we used to eat lunch on the lawn, underneath those trees," the Class of '63 alum says, pointing. "It was kind of [like] an idyllic college campus." Davis, whose family called Granite their academic home for four generations, feels the same way about the land as Anderson. Granite wasn't just a school, but a sacred site for neighborhood residents to meet and chat, a safe space for kids to play while their elders drank coffee and talked about their lives. "We're not just talking about some bricks and mortar," Davis says. "We're talking about the fabric of a community." A library would be a "great boon" to that community, Davis says, but he worries it'd require a tradeoff. "That's not ball fields. That's not picnic grounds," he says. "Yes, the library could be a good thing, but what does it come at the expense of?" In Davis' perfect world, all that land would become a park. He's not against adding housing, but he thinks public space would benefit more people and strengthen neighborhood ties. Surveying the fallen leaves and browning grass, Davis reflects on what public spaces mean for local inhabitants. "It's the living room of the community. It's where people feel ownership of a place. It's a grand opportunity for people to get together. In a way, it's like a church," he says. South Salt Lake agrees that it could use more open spaces. In a 2015 master plan, the city pledged to increase the number of parks within its borders, proposing to build 40.2 acres of such tracts so that all residents in the growing community live within a quarter-mile of a park. "The major weakness in the city is the limited amount of park space, and the lack of a major recreation center and gymnasium (including no private membership-based gyms). As the population grows, there are few available properties to add park space," the document states. Davis knows getting a park is a longshot at this point, given that Garbett has purchased a part of the grounds and is already selling homes, and Wasatch is under contract with the school district, but he says if he were still mayor he'd explore the possibility of the city using eminent domain to acquire the land. "Public use always trumps a private use if it's for the good of the community," he says. Wood, the current mayor, says the city is not presently pursuing the property, and she has never had a conversation with anyone about using eminent domain. "It's a reach," Davis acknowledges, "but the big problem is coming up with whatever the money is that would be settled on to purchase it." There are close-by parks in Salt Lake City and Murray, and South Salt Lake's Fitts Park is less than a half-mile down 500 East, but Davis believes the more public spaces, the better. His reasoning is practical as well as philosophical—it's a safety issue for young children to walk or ride their bikes or the bus on South Salt Lake's busy streets. "Children are crammed in between [them]," he says, "and so small neighborhood parks become significant in those areas." He says he harbors no ill will toward the homebuilders. Instead, his beef is with the Granite School District. From Davis' perspective, districts have the power to strengthen the quality of life of the citizenry who live near their schools. "They should have done everything they could to support the community, because they still have schools in that area," he says of the district, "and it's to their own advantage to make sure South Salt Lake is building strong neighborhoods where they can support strong schools—and they gave that away." Horsley says the district tried to work with South Salt Lake for eight years, over multiple purchasing agreements, before putting the land on the open market. "Why would we spend all that time if we were just interested in a high bidder?" he says. Horsley has heard some residents are miffed the district didn't just hand over the land to the city, but that wasn't feasible. The district, he says, serves eight different cities and municipal areas, including South Salt Lake. And it would have cost an estimated $250 million to renovate the high school; roughly $100,000 per student who attended Granite at the time it closed in 2009. "To dump those kind of resources into one building that only serves this small population was not deemed to be an appropriate use of taxpayer dollars by the board," he says. "Public perception on that issue is something I continue to battle every day here." Still, the district did its due diligence, Horsley says. "We worked through several different variants with the city. At the end of the day, the city was unable to purchase the property, it was as simple as that." Somewhere along the course of its century-long history, Granite High became more than a place that molded young minds. It was a space to gather and get to know your neighbor at a Friday night football game. An opportunity to be entertained and broaden your literary horizons during a theatrical play. A spot to play baseball or walk the track, a makeshift gym that helped keep local children and adults healthy. It was the common denominator among all townsfolk, regardless of color, creed or culture. "There just have not been good, positive things that uplift our community since that school closed," Anderson says from her home, a short distance from the ongoing construction on her alma mater's old campus. "What they put on it will never contribute what Granite contributed to this community." Davis peers at the vacant terrain and considers what was, and what could still be. That wide-open field is more than fallen leaves and weeds, he says. "That site, to me, is sacred." More than a year after Granite High School was obliterated, its presence remains. The large space has become a sort of Rorschach inkblot for everyone. When Davis looks at the grounds, he sees untapped potential, a possible park that could bring residents together like the school used to. When Cooper looks, he sees a library. When Mila looks, she sees a chance to salvage the city's failed attempts to get a community center. Wood sees a pragmatic solution that would honor the school's legacy. Garbett and Wasatch see an opportunity to earn money and address a housing shortage. It's hard for Anderson to put into words what she sees. She talks about what was lost when Granite was demolished, the raw feelings she still has over the failed bonds, how much the school meant to her as an educator and local resident. A lot comes to her mind ... but, mostly, what she sees are memories. "We lost something that everybody in the community identified with," Anderson says. "How do you measure what a school does for a community?"